How to access and download an eBook for the first time? How do I access an ebook? 1. In the library catalog, click on the Find It button located near the book’s title. In the new window, click the link to "Read full text." 2. When prompted, enter the barcode number from your Bee Card and last name, and select University of Baltimore as your library. (You will be asked for this information both on and off campus). 3. Once you’ve logged in, you will have five minutes to freely browse the book. After five minutes, you will be prompted to confirm that you want to borrow the book to continue reading. NOTE: as soon as you download or print you automatically initiate a loan. How long can I borrow the book? Can I print or copy and paste? All loans are for 7 days. Access to the book “turns off” after 7 days until you renew it. Books can not be “returned” early. You can print up to 20% of the total pages and copy/paste up to 5% of the total pages. You must download the book in order to print or copy and paste. How does downloading work? What does downloading an ebook allow me to do? When using a public computer, you can read an ebook online, without downloading the book or any software. Be advised, however, without downloading a book, you will be unable to print or use the copy and paste function. (If you were to download an ebook to a public workstation, the book would be saved to that computer and only accessible from that computer). If you are using your own computer, or mobile device, you can download the book using Adobe Digital Editions or the Bluefire Reader App. Look below for instructions on how to download an ebook for the first time. To download an ebook for the first time, you must first download Adobe Digital Editions (ADE), create an Adobe ID, and activate your computer with Adobe. 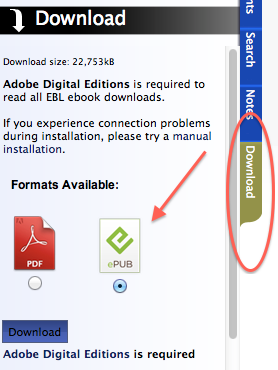 When viewing an ebook (after clicking Read Online), click on the Downloads tab in the left menu and select Adobe Digital Editions as the desired format. If you click the link to ADE, you will be brought to the Adobe website from which you can download and install ADE. An Adobe ID connects the books you download to your Adobe account and you as a user, rather than an individual workstation or device. After download ADE, a new window will appear to create an Adobe ID. Follow the instructions. Once the first two steps are complete, a window will pop up and ask your permission to activate your computer. eBooks in the pilot project can be downloaded to any e-reader which supports Adobe Digital Editions, or mobile device with applications that support Adobe Digital Editions, such as the iPad, iPhone, Android and the Kindle Fire by using the free Bluefire Reader App. (These instructions include more detailed steps about how to access library ebooks through the Bluefire Reader). Kindle Fire users, take a look at these instructions about accessing library ebooks and these instructions about installing the Bluefire Reader on the Kindle Fire. For a list of e-readers which support Adoble Digital Editions, look here. Langsdale also has a PDF guide to transferring EBSCOHost eBooks to eReaders and devices, which you can view here. Once you have "checked out" a book, you can read it online in your browser. To get back to a book you are reading, you can go to http://usmai.eblib.com.proxy-ub.researchport.umd.edu/patron/Default.aspx. You should be prompted to login with your UB ID and password and select Univeristy of Baltimore as your home library. From there, you can see a list of ebooks that you have checked out, or have recently viewed.